Dharini Parthasarathy just completed her first year at New York University, where she is pursuing a master’s degree in Higher Education and Student Affairs. During undergrad, she majored in STEM fields but found her purpose and passion for supporting students and creating pathways for college success. Here she offers tips and strategies for getting recommendation letters for your graduate school applications. Recommendation letters are critical to any college, scholarship, or job application. They provide a glimpse of how others see you—your qualities, competencies, and even challenges. Typically, the majority of any application is authored by you (like your personal statement and résumé) and describes your academic ability objectively (such as test scores and transcripts.). But the recommendation letter is a subjective third-person narrative and provides a more holistic and three-dimensional view of who you are as a candidate. It might tip the odds of acceptance in your favor! One, I had to put myself out there and ask. I felt vulnerable and insecure, not entirely sure if my requests would be accepted. Two, I felt like I was giving up control of an extremely important part of my application to a third party; I wondered how accountable my references would be. And three, I didn’t know what the relationship between my reference and me was even supposed to look like. How much information and direction would I need to provide esteemed professors or professionals, who surely knew what they were doing? In this article, I’ll address some of the challenges I faced and provide a clear process for requesting your own grad school recommendation letters. Your reference should know you well. Avoid asking someone you’ve only taken one class with or have only spoken to a few times. Ultimately, they need to have and be able to convey a good idea of who you are as an applicant. Your reference should be able to provide a positive recommendation. If you don’t believe your choice can justifiably provide a positive review, avoid asking them. A negative or lackluster reference could work against you in the application process—it could make the admission or recruitment team wonder why you asked them in the first place. Your reference should either be reputable in their own field or able to connect to your own. In my case, I was applying to graduate schools in the field of Higher Education and Student Affairs. Thus, I asked professors, who could speak to my academic capabilities toward finishing a graduate-level program, and student affairs professionals, who could speak to my experience in the field. Once you have a list of potential references, separate them by academic, professional, and personal references. Each type of reference can speak to a different aspect of your character and capabilities. Academic references can go into your academic career and goals, comment on the likelihood of your success in the program, and speak to your strengths in the classroom. Professional references can dive into your professional goals, back your qualifications for the program or position, comment on your accomplishments and potential, and speak about any experience you have in the field. Personal references can speak about your character and personality, your leadership capabilities, and what makes you a good fit for the program’s values and mission. Take a good, good look at what the application requires from your recommendation letters. Typically, specific instructions are given about the number and type of references. A description of what the recommendation letters should address may also be given. Match these requirements against your potential references and their types. When you make your request, you’ll be able to clearly state what the recommendation letter should include. 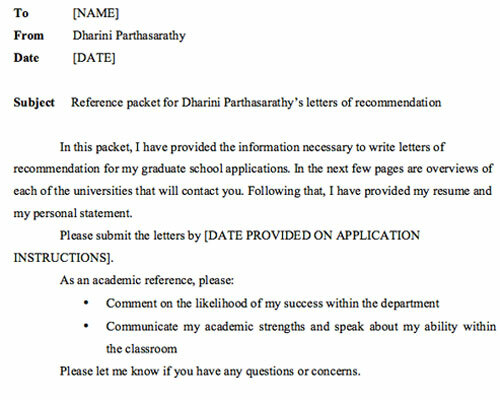 If the application does not provide any instructions about recommendation letters, I suggest providing two to three references, split between academic and professional. Here is the part we’ve been waiting for: asking your references if they are willing and able to write you a letter. I strongly suggest you ask them in person—set up an appointment with them, or stop by their office. If you’ve given thoughtful consideration to who your references could be, I highly doubt they’d be unwilling to meet with you. Keep in mind that your references will need time to write your letter (I gave mine about six weeks), so set up the meeting accordingly. When you meet with your reference, provide a clear idea of what the recommendation will be for, some of the expectations, and a general timeline. Following up to this meeting is critical. In my follow-ups (when the reference agreed to write a letter), I provided a letter of recommendation packet so they had a clear idea of what to do. If your potential reference is unable to write you a letter, do not take it to heart. Sometimes they might just be too busy, or they may not be confident in their ability to portray you for the application. Thank them for their time and try to think of another potential reference to ask. What you’re applying for: I provided a short summary of each of the programs I was applying to. For graduate school applications, it’s very important to have the program title and degree information accurate. For most of my programs, I was able to find this summary on their website. If the programs had a specific link, or if they would send my reference an email, I made sure to include this information here. Supporting documentation: I provided both my personal statement and résumé in this packet. This gave my references a good idea of what the rest of my application looked like so they could tailor the recommendation to fit cohesively. Timeline: I provided my references a deadline for submitting their letters in the packet as well as instructions on how to submit them. Since I asked my references well in advance of the deadline (at least 30 days, though I gave myself some leeway and asked them about six weeks in advance), they had enough time to compose a thoughtful letter. Once my references had all the information they needed, it seemed like a big load was taken off my shoulders. However, it’s very important to keep track of your recommendation letters. I checked my applications frequently to see if my references had uploaded any letters. If the deadline was approaching with no sign of a letter, I emailed my reference a reminder. While it was daunting to “check in” with my reference, sometimes the letter had just slipped their mind and a reminder helped them get back on track. You’ve submitted your application(s), and all your recommendation letters have been uploaded—yay! It’s critical to keep your references up to date about your journey, so let them know where you are in the process. They wrote you a letter because they are invested in your goals, and they’re usually very happy and supportive about the results. Keep in touch with them, and not just for future applications. All the reasons they made great references mean they can be valuable mentors and advisors as you move toward your goals. Start searching for grad schools on CollegeXpress.